Halong Bay is one of those world landmarks that are readily recognizable by people all over the world. 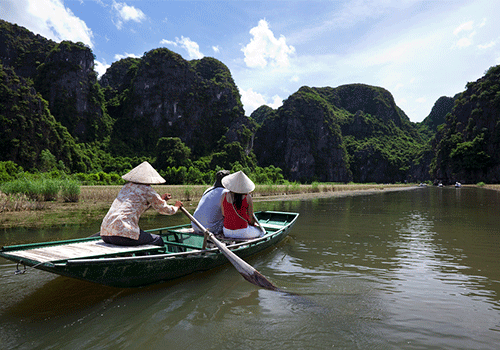 It is easy to see how this body of water off the country of Vietnam became one of UNESO’s World Heritage sites. It has been called the most beautiful bay in the world. What distinguishes this bay is the preponderance of islands and islets – about 1600 of them – all rising steeply from the greenish waters with steep rocky sides topped by dense green vegetation. A little over half of them have names, quite often derived from their shape and similarity to an animal. These islands are formed in the most part by limestone, and the interaction of the rock and ocean carved these islands into their conical shape and hollowed many of them out forming great caves or cave systems. You can visit some of these grottos on guided tours. Another unusual feature of these islands is that many also boast lakes. On a cruise tour of the bay, you may see whole communities living in floating villages where the people earn their living from the sea. There are several hundred different kinds of fish, and over double that in varieties of shell fish. Wildlife, if not people, also live on the islands. You may spot monkeys, lizards, and various species of birds. 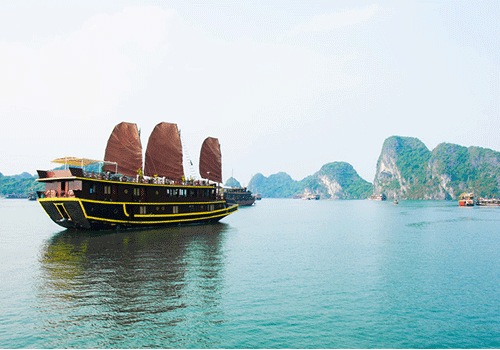 As you glide through the waters of this bay, it is easy to imagine how the legend of Halong Bay came into being. 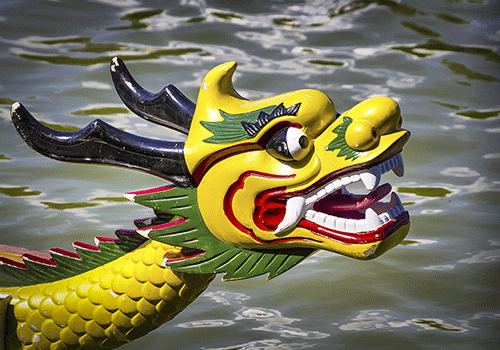 The tale goes that when Vietnam was in its infancy as a country, the gods sent dragons to help the people fight against their enemies. Instead of fire, the dragons breathed out jewels and jade which became the island and islets of the bay emerging suddenly from the ocean to prevent the passage of enemy boats by shipwreck. After the battle, the dragons descended to live peacefully on the islands. 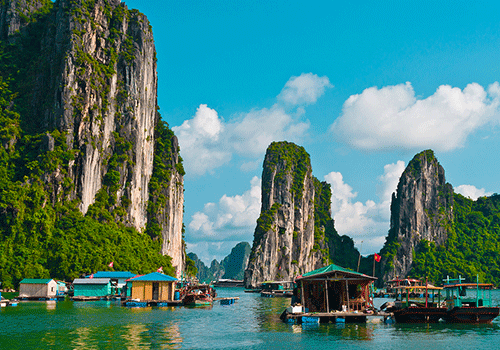 For the most part, the islands of Halong Bay are tiny and uninhabited but a few are larger, with hotels and beaches popular with visitors. You can tour the bay in any one of a vast number of junks (traditional boats) which take you past and weave through the many islands like a journey through a maze. If you are fortunate and adventurous enough, you can overnight in a luxury junk –the rooms are sumptuous, not what you would expect from the exterior view of the vessel. Book a river cruise such as the Riches of the Mekong , an itinerary offered by AmaWaterways touring Vietnam,and Cambodia via the Mekong River, with side trips such as this to Halong Bay, and you have an opportunity to spend the night on Halong Bay in one of these luxurious junks. Now there is a tale to tell when you return home! Article originally appeared on Real Travel Experts. Feature photo courtesy of Anne Lin on Unsplash.